Chemistry: PbCuSO4(OH)2, Lead Copper Sulfate Hydroxide. Linarite is colored a bright azure blue color. This beautiful and somewhat rare mineral is usually found as crusts of small crystals. Even with the small crystals, the color is always intense. Azurite is a mineral that can be easily confused with linarite. However, linarite does not react at all to dilute hydrochloric acid. 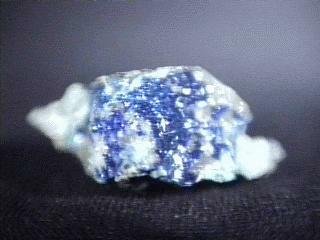 Linarite is formed from the oxidation of lead and copper minerals such as galena and chalcopyrite. The color is impressive for the tiny sparkling crystals. One look at the mineral will convince most collectors that they need an example of linarite in their collections. Color is bright azure blue. Luster is vitreous to adamantine to earthy in massive specimens. Crystal Habits include prismatic crystals and more rarely platy to tabular, all crystals tend to have multiple facets. Crystals are always tiny to small growing off encrustations on host rocks. Also as earthy masses. Cleavage is perfect in one direction but only seen in the larger crystals. Associated Minerals are galena, chalcopyrite, brochantite, malachite and cerussite. Other Characteristics: some specimens show an alignment of crystals. Notable Occurrences include Tiger, Arizona and Butte, Montana, USA; Leadhills, Scotland; Spain and Argentina. Best Field Indicators are crystal habit, associations, color and lack of reaction to acid.